Technical analysis is a key component to our stock selection process as well as our buy-sell decisions. One of the first choices we need to make is the format of the price chart. Sometimes that decision is difficult if presented with several outstanding options. For example, you’re offered a choice of two tickets to one of two Yankee games: versus the Red Sox or the METS. Both are great opportunities but since your wife’s family is from Boston, you go with the METS (just a little humor). In a similar fashion, when choosing between a bar or candlestick chart, there is no poor selection. In my books, I use bar charts, as I slightly favor the appearance of these charts. I know that there are many BCIs who prefer candlesticks and I certainly respect that preference. The one chart that I would ask you not to use is the line chart which provides the least amount of information. I will briefly define the line chart and explore in more detail the other two. This is a very basic chart created by connecting a series of closing prices of a particular security with a line. •The candlestick to your right (black) closed lower than the open. Like the candlestick chart, this price chart consists of session high and lows as well as the opening and closing prices. It is also referred to as the O-H-L-C bar. •Black: Depicts a higher close than the previous day’s close. •In candlestick charts, the relationship between open and close is depicted by the color of the body, whereas with bar charts that relationship is shown by horizontal lines projecting from the vertical. •The bar chart places greater emphasis on the closing price of the stock in relation to the PRIOR periods close. The candlestick version places the highest importance of the close as it relates to the open of the SAME day. This is the main reason I prefer the bar chart but the difference is negligible. Both the candlestick and bar charts offer much more information than the line charts. Some chartists prefer the color feature of the candlestick bodies while others prefer the emphasis on closing price comparison with the previous period offered by the bar charts. You can’t go wrong with either one. My advice is to select the chart you like and use it consistently so reading a technical chart will take only a few seconds. I can’t tell you how grateful I am to you for making my first book, Cashing in on Covered Calls, number 1 on Amazon.com for covered call writing since its publication 5 years ago. Thanks also for keeping my other two books in the second and third slots! I am truly humbled. In conjunction with this anniversary, we are also making available a new product: a yearly subscription to our premium membership. Many of you have requested this and we have listened. You subscribe for 12 months and get one month FREE. From now through the end of January all those who subscribe to the yearly membership will also receive a FREE E-book version of Cashing in on Covered Calls. The product is currently available in the Blue Collar store. I am in the process of completing a project that has been on my mind for years. I am writing a book for you. 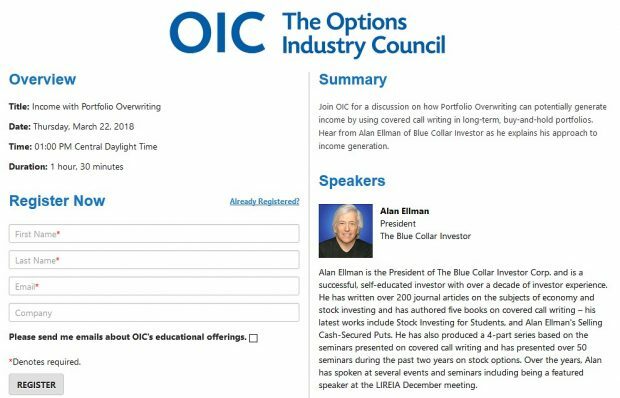 I feel that it is the most important undertaking for the Blue Collar Investor to date. I expect publication within the next 2-3 months. The Fed chairman also expressed concern regarding the damage the “fiscal cliff” issue can cause to our economy. This is the main reason BCI has been taking such a conservative stance in our investment decisions. Let’s get with it, Congress!!! For the week, the S&P 500 dropped by 0.3% for a year-to-date return of 15%, including dividends. BCI: After Chairman Bernanke’s comments regarding short-term interest rates, this site remains bullish on the long-term outlook for both our economy and the stock market. We are waiting to see the outcome of Congress’ response to the “fiscal cliff” issues. As a result, we continue to favor in-the-money strikes, low-beta stocks and ETFs in our portfolios. I am a new subscriber to BCI. Really enjoying you articles and your explanation of all phases of covered call writing and trading in general. One question about charts. Which time frame do you use? I know it’s somewhere in all this sites info, I just haven’t seen it yet. It’s great to have you as a new premium member! The Weekly Report for 12-14-12 has been uploaded to the Premium Member website and is available for download. Do you still recommend Vanguard funds to build up enough cash to sell covered call options? Thanks. ← Portfolio Overwriting- Selling Covered Calls on Stocks You Want to Keep.